at all hours of the day at any track you race! Join today and virtually jet your engine! Maintain your optimum setup from the cool early morning to the heat of the afternoon. Adjust to different elevations and weather patterns easily when traveling to different tracks. Keep track of your system performance including system pressure and air/fuel ratio. Know what your jetting is in the click of a button. No more time wasted on trial and error. Be ready to race right out of the trailer by planning the day before. Know how to adjust your setup with different percentages of nitro. If you have a smartphone, you have your jetting calculator with you everywhere you go. Set up your first baseline and you are ready to start running calculations! Easily switch between your methanol-only and nitro setup. Or switch between your high and low altitude setup. Browse the current weather at your track then click to add it seamlessly to your calculations. Maintain your records by exporting your data to a spreadsheet program. 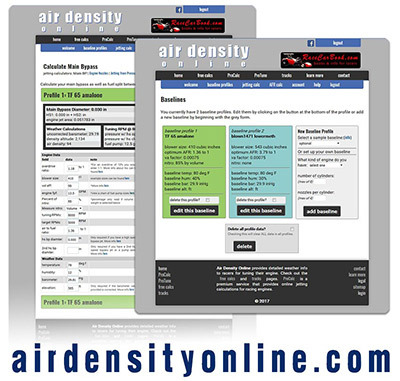 Find your optimum air/fuel ratio or test your modifications for air/fuel ratio changes. Find out how much to adjust your main bypass. Find out how to modify your fuel system pressure. Run calculations on specific nozzles to see how they compare to the rest. I've taken the 13 gallon pump off the car. Back to my 7 gallon pump... Again, I know right where I'll be because of airdensityonline.com. Thank you for such a great resource! I depend on the ProCalc calculator app. for my fuel injection tuning. I do not have to rely on my engine builder or prior flow bench test any longer. Get your car dialed in for any track, anywhere you race. ProCalc uses engineering principles such as air/fuel ratio in order to calculate the best jetting for your current environment. This enables you to get the most power out of your mechanical fuel injection engine in a repeatable manner. No matter how well you have set up your fuel injection, changing weather and environment can make your car run poorly. Variables such as temperature, humidity, and elevation influence how much oxygen is in the air. These changes can affect combustion that, without adequate adjustments, can cause your engine's performance to suffer. Read our FAQ for more information. ProCalc and ProTune were created by father-daughter duo Bob and Jennifer Szabo in order to help racing teams get the best jetting for their MFI combination. Bob Szabo is a retired welding engineer, long-time drag racer, and author of 6 books about racing mechanical fuel injection at RaceCarBook.com. Bob has decades of experience in the automotive industry and as a drag racer. He has put that experience together in order to assist racers with their engine setups. If you would like further information or have any questions, Bob and his web-developer daughter, Jennifer, will be happy to talk with you. Fill out the contact form and they will get back to you ASAP! -Payments are handled through paypal. Upon successful payment you will receive an email that will direct you to complete the registration process. Please check your spam folder in the event that you do not receive your confirmation email. -All payments are good for 1 year. You must log in and pay again in order to extend your membership. Memberships are not automatically re-billed. -Your contact information, including your email address, are never shared with third parties. A reminder email will be sent when your membership is nearing it's expiration date and we reserve the right to send occasional announcement emails. -Questions and comments can be sent via our contact page.